Just like to say you are the greatest pitcher to me and your perfect game was special but every start you have is much watch tv keep it up hope to be in kings court to watch you. Felix unfortunately I was not able to see your perfect game because I was at work but me and my friends from work heard about what was happening and we all were watching it on TV and KEEP IT UP⚾!!! 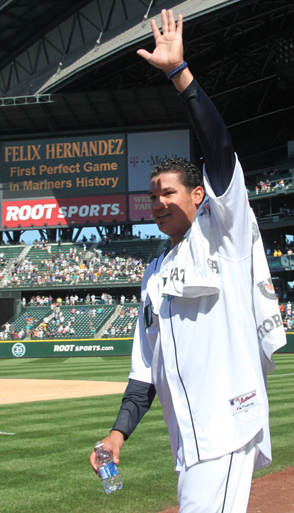 Felix, you are an amazing part of the City of Seattle. I had great seats the day of your perfect game, unfortunately I ended up in emergency surgery with an infected abscess in the back of my leg and watched from my bed at Highline Hospital. I was in for 11 days, out for 9 days then back in for 7 days… The good news is, I was given the Doctors ok to resume normal activity in time for the last three games. I got to see you pitch in person and win or lose, you are AMAZING! Thank You for your PERFECTION, it made my surgery much easier to go through as I had a huge smile on my face as they wheeled me into the Operating Room… I can’t wait for next season!